In 1978 Magnavox came out with their second major system, the Odyssey�, which was totally different than the various Odyssey PONG systems. It was a computer with BASIC programming, but many people regarded it as a home video game console. It came with two controllers, RF switch with TV box, power supply, and the Speedway, Spinout and Cryptologic game cartridge. 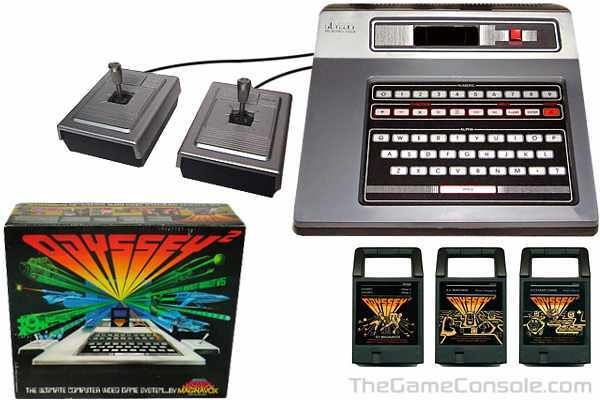 The Odyssey� was the first home video game console to introduce what was to become the standard joystick design of the 1970s and 80s: a moderately sized black joystick unit, held in the left hand, with an eight-direction stick that was manipulated with the right hand. In the upper corner of the joystick was a single 'Action' button. The area that the Odyssey� may well be best remembered for was its pioneering fusion of board and video games: The Master Strategy Series. The first game released was the instant classic Quest for the Rings!, with game play somewhat similar to Dungeons & Dragons, and a story line reminiscent of J. R. R. Tolkien's The Lord of the Rings.